10 April 2017 Unknown Knowns is Gordon Cheung’s third exhibition at Edel Assanti, London. The exhibition’s title is drawn from Slavoj Zizek’s observation that Donald Rumsfeld’s theory of knowledge omitted a crucial fourth category: unknown knowns – the things we don’t realise we know; the unconscious beliefs and prejudices that determine our perceptions and actions. 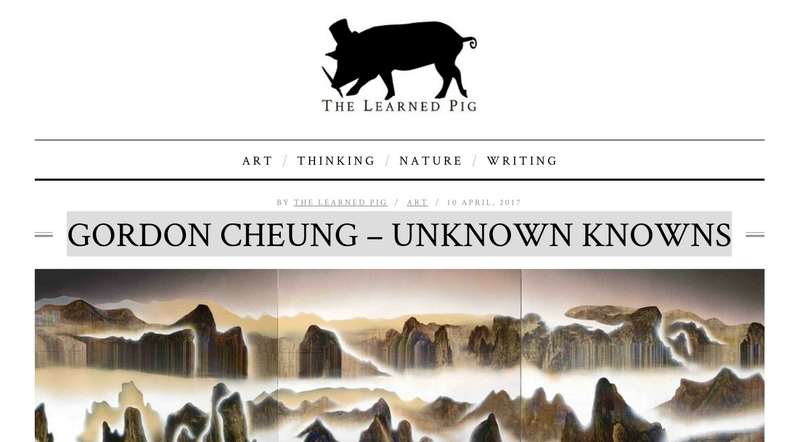 Unknown Knowns continues Gordon Cheung’s interest in historical revisionism and the underlying mechanics of power that govern our understanding of the world. The exhibition is populated by disparate cultural signifiers drawn from cartography, political propaganda, anonymous internet imagery and art history. Imagery itself is Cheung’s medium, either co-opted in the creation of multifaceted paintings or manipulated via digital algorithms, and ultimately used to challenge dominant political narratives and visual culture’s active participation in them. We caught up with Gordon Cheung to discuss politics, power, cultural amnesia, and classical Chinese landscape iconography. Over your career, much of your work has addressed some of the more hubristic aspects of Western capitalism – the financial crisis of 2008, utopian Modernism, the Dutch tulip bubble. What prompted the shift towards exploring Chinese culture and politics? Although I have been making work about the rise of China as a superpower for many years I think a concentrated focus occurred during 2015 when China built it’s first artificial island in South China Sea. I was trying to understand what was happening there. As China constructed increasing amounts of artificial islands, a US Navy General observing the activity from a warship described it as the ‘Great Wall of Sand’ which makes up the title of the main painting in my current show at Edel Assanti. In 2011 Hillary Clinton, US Secretary of State wrote an article and declared ‘America’s Pacific Century’ that she followed with increasing US bases around China known as the ‘Pivot to Asia’ otherwise called the encirclement or containment of China. Over 400 US military bases surround China with missiles, warships, spy planes, submarines, war games and sales of weapons to nations around China. 4 years after Clinton’s declaration of America’s Pacific Century and increased military presence, China built it’s first artificial island by dredging up pristine coral, pulverising, concentrating and concreting over, thereby creating ‘facts on the ground’ from which theoretically 200 nautical miles can be claimed as sovereign territory. The South China Sea contains 10% of the world’s fisheries, thought to have oil and gas fields, is a trade route worth $3-9 trillion a year and whoever comes to dominate this naval silk road has political leverage over all nations who depend on it. This redrawing of geopolitical lines will be where some of the 21st Century’s political dramas will be. In the painting ‘Great Wall of Sand (Unknown Knowns)’ the map under the floating islands is the original 9 dash line map published in 1949 and was used ambiguosly to claim islands within the dashes and later after a US oil man suggested in 1990 to use the map to claim the entire territory for oil and gas fields, China changed their rhetoric to suggest claim of the entire area of the 9 dash line. This is contested by other nations who also claim those territories and islands. The floating shapes are the artificial islands built by China and the far off constellation map is the One Belt One Road map which is the new silk road being proposed by China. The painting converges past, present and future maps compressed in between the holy mountains of Sinai and Song. Could you say a little about the subject matter for Jumping Through Hoops? It reminds me a little of your previous rodeo works, but what attracted you to this imagery in particular? Around 2000 in a London Chinatown second hand bookshop I found an old book of Chinese Acrobats photographs during the ‘Hundred Flowers Campaign’ that have been water colour tinted. I knew as soon as I opened it that I wanted to make something from the images but didn’t know what or how at the time. All I knew was that I loved the imagery. The Let a Hundred Flowers Bloom era was a period of history when Mao requested criticism from the people about the policies being enacted. As people gave criticism, names were noted and at the end of a year many of those people were publicly humiliated and disappeared into labour camps. Acrobats are used by many cultures and civilisations as a form of soft power to express the aspirational pinnacle of human physicality and mental strength, something to be proud of in terms of what that nation can produce. So what attracted me to the image is partially the beauty of a nostalgic looking photograph during a period of dark history where people were disappearing for criticism that was reclassified as dissent. When I discovered an open source algorithm that enabled me to reorganise the pixels according to a code I knew that I wanted to apply it to these images to effectively blur a sanctioned history in order to destabilise its dominant narrative to question what was hidden. Landscape remains an important aspect of your work, but this show sees you “hijack traditional Chinese landscapes”. How does the Chinese landscape tradition compare to the western tradition? And how do those similarities/differences come through in these works? I subverted the romantic iconography of the Classical Chinese landscape by substituting the pagoda or hut with ‘nail houses’ otherwise called holdout houses. They are the last properties to not sell to the developers who pressure the owners by cutting off electricity, gas, water and access resulting in what can look like surreal fortresses with a moat. A pagoda in Chinese landscape paintings symbolises a retreat and focal point to existentially meditate about our relationship to nature. The substitution of this motif for the nail house so called due to the proverb ‘the nail that sticks up will be banged down’ mutates the symbolism in my works to contemplate our relationship to the idea of progress. Eventually the nail house images were censored by China due to how they became viral images across social media as symbols of rebellion and the individual standing up to an enormous power. I have always been drawn to the tradition of Western Sublime paintings for their visual rhetoric of epic vast spaces where nature overwhelms the individual into a transcendent experience that brings you closer to God. I would use this genre but create landscapes of information from the stock listings of the Financial Times as a metaphor for the modern space that surrounds us; an invisible datascape that saturates and influences all of us on a global scale. If you think of what is omnipresent, omniscient and omnipotent, you could think of the stock market in the same way as some people think of God. I wanted to converge these ideas and convey the megalithic structure in which we all exist. It is for me a contemporary space. According to some scholars classical Chinese landscape paintings are an expression of the educated elite’s relationship to the state with the mountains representing the state so these genres of paintings of Western and Chinese have always had a political dimension to them. Your giclée prints have a very glitchy quality about them in places. Your work has always nodded towards virtual reality but these remind me a little of James Bridle’s New Aesthetic. What made you want to take this pixelated approach to some of the canonical works of art history? One of the first instances of using the glitch technique was with high resolution photos of still life paintings from the Dutch Golden Age around 3 years ago. I was trying to understand how the 2008 global financial crisis happened and it led me to looking at a period of history considered to be the Birth of Modern Capitalism with the rise of the East India Trade Company and first recorded economic bubble with the speculation over tulip bulbs. The romantic language used to describe a still life is of transient beauty, futile materialism and fragile mortality. It’s also a display of wealth, power and status. Yet it rarely, if ever, reveals how it might have accrued these symbols of luxury. The Dutch Golden Age Still life genre ideologically launders its darker history of civilisation with its militarised trade routes, colonisation and slavery. By ‘glitching’ the photographs of the paintings that reorders the pixels it suggests revising historical amnesia and to unweave the history written by victors. The reordering of the pixels also suggests the repetition of histories in a different form and the transition from one era to the next. Could you say a little about the technique behind them? The glitch technique is from an algorithm that reorders the pixels of an image into a digital sands of time effect. A glitch is a technological mistake that results in the distortion of an image or a break down in code. A sub-culture of artists appreciate the aesthetics of this ‘mistake’ and have developed codes to deliberately recreate them. I was very interested in the way how it makes you simultaneously aware of the technology that produces the illusion of the image, the awareness of the surface and screen and the distortion of the image. It reveals the multiple dimensions of reality erupted by the glitch which is what I also endeavour to form in my photo collage paintings. Could you also say a little about your very distinctive painting technique, whereby you use dried smears of paint almost like objects for a collage? How much has that technique changed and developed over the course of your career? When I first started out at Central Saint Martins School of Art in 1994 I substituted paint for collage and the brush for technology. What I mean is that I would collage financial newspaper and maps as metaphors of our global landscape, use that collage on a photocopier machine and while it’s being scanned would move it, resulting in a smeared image and what I called ‘simulated brushstrokes’ that were then used to create ‘virtual paintings’. My thinking was that it became a variant of Chinese ink painting where image, poem and writing are merged into one form. This is one of the core ideas in my work where I searched for new ways to extend the language of painting. Collaging dried paint marks is one of the techniques or processes that I use that allows me to bend, loop and fold the paint into forms that could not be conventionally painted. Accumulatively with all the other processes and techniques in my work I am encouraging a deconstructive reading of the work and by extension the narratives that are interwoven. Donald Rumsfeld was widely lampooned for that “known unknowns” quotation that informs the exhibition title, but artists (and others) are increasingly fascinated by it. What kinds of truths can artists explore that politicians cannot (or should not)? The exhibition explores illusionary truths that are constructed by cultural, political and historical narratives that network to shape civilisations. It’s also about the way how truths can be used to disguise darker truths and how we ‘un-know knowns’ dependent on the agendas we are devoted to. Rumsfeld’s gibberish was what I think of as an audibly absurd ‘drums of war’ speech that belongs in a Dr Strangelove script but its tragic lies led to mass deaths and a failed state. It’s obvious clumsiness regardless of how profound he thought he sounded offers us the opportunity to laugh at his speech but even if it was instead a refined work of oration the consequences would have been the same. An artist is generally free in a democratic society that upholds freedom of expression and speech to explore any truths they want to. Whether society and culture accepts or elevates to any importance what the artist is exploring is another matter. What kind of relationship does/should art have to truth? In terms of being an artist for me, it’s important to be profoundly connected to what it is that you feel compelled to make. Perhaps this is art’s relationship to truth. It’s one of my main drives for making art. So what do I mean by this? It’s a recognition of your developing psyche, of where you come from and the constant question of why I even exist that is in a state of constant flux. The emotions from those tensions of searching for self-understanding compel me to create a visual topography that produces epiphanies in the act of making. The harder I try to comprehend what the truth of a situation might be the further I have to develop my language. My own art tries to reflect on the type of civilisation we live in, which involves disentangling the narratives of truth to recognise the different agendas that determine our existence. Ultimately to try and understand the different dimensions of ourselves including the shadowy strangers within us. Only then can we be vigilant with who we are and what we will become. “Gordon Cheung: Unknown Knowns” is on view at Edel Assanti, London, until April 20, 2017.